Your question suggests an error (i.e., an error that you’re seeking to identify as an error). Your question (or, if you prefer, the claim that the universe is finite) suggests that “the universe” is an entity. You are asking for an explanation of the claim that the size or duration of that entity is limited. The short answer is: If, by “the universe”, you are referring to an entity, then “the universe” is neither finite nor infinite because “the universe” is not an entity. An entity is what we rightly call a “thing”. An entity/thing has attributes. Thus a stop sign is an entity with attributes: octagonal, white rimmed, otherwise red, with white lettering upon it that reads “STOP”. The phrase “the universe” rightly means: “every thing” (i.e., each and every entity, excluding none). As such, it does not refer to an entity, but to entities plural. The phrase “the universe” wrongly means: “all entities, considered collectively, as a single entity” or, if you like an “everything“. All attributes can be found among “all entities”. However, “all entities” considered collectively (i.e., “everything”) – i.e., considered as a single entity or thing – has no attributes. That which is “EVERY thing” in general is “NO thing” in particular…or, more succinctly: “That which is EVERYTHING is NOTHING”. “The universe” – whether it is rightly defined as “all entities” or wrongly defined as “all things considered collectively or as a group” – has no identity. An entity has an identity. The universe, lacking an identity, is not an entity. “All entities” is not a reference to a *number* of entities. Rather, it is a reference to an entity’s inclusion in consideration…or a non-exclusion of each and every entity, if you will. “Every thing” is the universe. 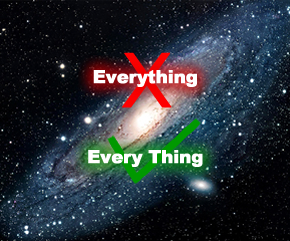 “Some things” and “one thing” are not references to “every thing”, and, for that reason, they are not references to “the universe”. That is the sort of question one is asking when one asks if the universe is finite iff (i.e., if and only if) by “the universe” one is referring to an entity. However, if you regard “the universe” as a reference to “each and every entity” – i.e., if you do not use “the universe” to refer to an entity – then “The universe is finite” is just another way of saying “Each and every entity is finite”. That is perfectly defensible. As an aside: because “the universe” is not an entity, the law of identity (A is A) does not answer your question about why the universe is finite. “A is A” is a statement about entities being what they are. It is not a statement about an entity called “everything” or “the universe” being what “it” is.